Business is about getting paid. 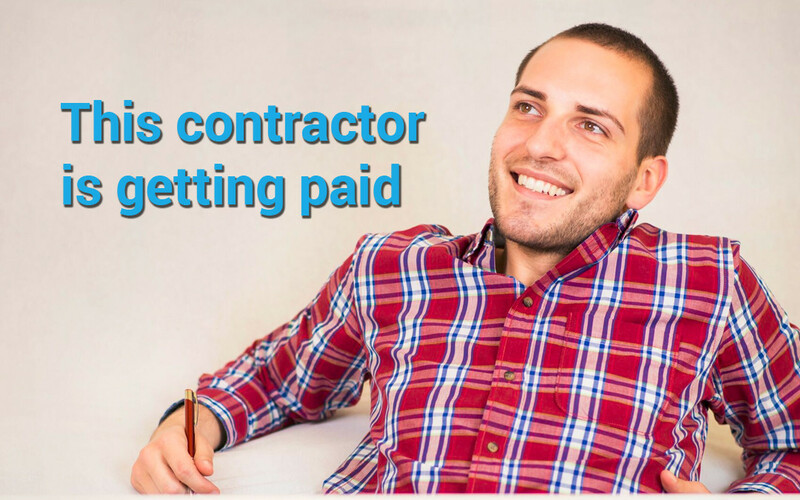 As a contractor, it’s not always about just getting paid, it’s about getting paid on time. Today we offer up a few tips on estimating and invoicing to help you manage your cash flow and get paid on time. Fortunately, JobFLEX can help you put together professional looking quotes and invoices to streamline the payment process with your customers. Materials cost money and contractors don’t need to be carrying that cost. Estimates should clearly state up front that you require a down payment of 30 to 50 percent down prior to scheduling the remodel or installation. This is absolutely critical for a contracting business, as getting money up front helps you maintain a more consistent cash flow. Once a customer accepts a quote, smart contractors provide tentative scheduling but don’t confirm final scheduling of the job until they have received the down payment. How JobFLEX helps: When creating a quote, JobFLEX includes contract terms by default. You can adjust them if you’d like, but the standard contract terms included in a JobFLEX quote make it clear that a 50% down payment is required. When you invoice a customer you need to include payment terms so they have a clear understanding of what “getting paid on time” means. Having consistent payment terms will help you better budget your business, schedule service dates, and pay employees. Contractors who don’t define payment terms are more likely to waste a lot of their time tracking down customers for late payments and struggling with cash flow problems. Payment terms also help customers know how they must budget for your services. You can even work on a discount system for customers who pay early. Customers appreciate contractors who have an organized approach and clear payment terms. Gaining a reputation as a contractor who “has it together” can only help you gain more word of mouth business. What payment terms should you use? There are several commonly used payment terms that businesses use, but as a contractor it makes the most sense to go with due upon receipt. This means payment is due once the invoice is received and when using a tool like JobFLEX you can issue the invoice the day you finish the job on site with the customer. This means you can collect the payment before you leave the jobsite because the customer already has the final invoice. If the customer doesn’t pay immediately, the seller has the legal right to reclaim the goods. There are other options for payment terms that give customers more leeway like Net 30 or EOM (end of month), but for the sake of your cash flow it’s best to go with due upon receipt. Once you’ve decided on your payment terms, keep them consistent, non-negotiable and do not deviate. How JobFLEX helps: When creating an invoice in JobFLEX you have the choice of setting the default number of days in which the invoice is due. Select zero and every invoice will clearly state that payment is due upon receipt. 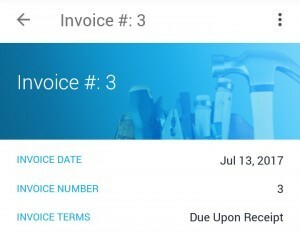 You can also add details about additional fees for late payments within the notes section of your invoice to provide even more motivation for customers to pay on time. 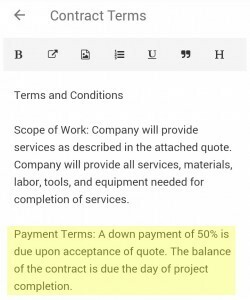 Keeping terms consistent and non-negotiable is easier when you have the right tool to help you create professional quotes and invoices with detailed terms. The JobFLEX app takes the time and guesswork out of creating and sending quotes and invoices to customers. Try a free trial today and see just how JobFLEX can improve your estimating and invoicing processes.